I am new to Runewars. 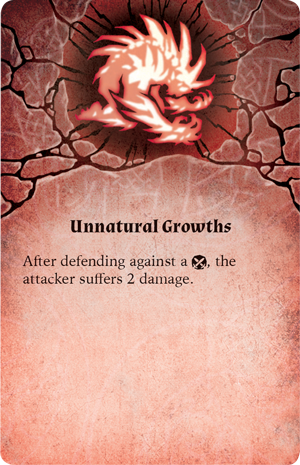 I am trying find out where "unnatural growth" is described. I looked in RRG and can't find a card for it. Same for keyword Lethal. It is not in my RRG is there an update somewhere? Sorry to ask basic questions! Lethal X: Adds X amount of damage (not hits) to the damage pool before assigning damage for wounds. So if you had 2 hits, at 2 threat and had lethal 1, you'd be doing 2(hits)x2(threat) +1(lethal) for a total of 5 damage. If you ever see Protected X -- it's the opposite of lethal -- it subtracts damage. You can find the details in the Kethra A'laak Hero Expansion box. It's a condition that comes with her. Below is the text concerning the conditions rules outlined in the leaflet included in her expansion pack. Thank you. I did not get this in my expansion box.